Well you asked for it and I got it. 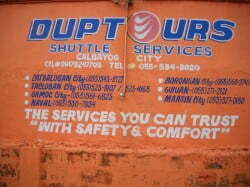 I walked down to all 4 of the shuttle van services here in Calbayog City and asked about their services. It wasn’t so easy either because of the language barrier, but I finally got enough information that I thought I could go ahead and write this post. I figure that if you need more information you can ask me and I’ll find out for you or, since I will include phone numbers, you can call the shuttle service directly. I really do not have any rhyme or reason to the format. I am just putting down the only information that I was able to make them understand that I wanted, plus a little more I figured out while I was looking around the office. These services are in no particular order except I do have Grand Tours as the last entry for a reason. When I went by there, they were really busy, which is normal for them. They really did not have much time to talk but they did give me their website, which I was slightly surprised that they even had, so I let it go at that for the time being until I took a look at their site. After I looked at it I noticed that it did not have near the amount of information that I wanted so I had to go back to them to get the answers. I figured I would go ahead and get the other 3 written down so all I would have to do is add in the Grand Tours information, proofread, spell check and publish. All listed rates are for one way only. Locations with phones numbers: The guy in the office assured me that these phone numbers were still valid. This really is a nice spread out of the offices. They are all south of Calbayog City. Borongan City is on the coast of East Samar and Guiuan is way south on a small strip. The furthest one south is Maasin City in Southern Leyte. I tried to ask them if DupTours goes to Mindanao, but I don’t think they understood me correctly. I think that the station in Maasin City probable has vans heading further south, but you would have to get in touch with them or make the trip yourself to find out. 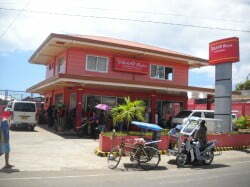 Ormoc City is a major port for the ferry boats traveling to various points of the Philippines. They do let you charter their vans and the price depends on where you are going. He told me that the charter price from Calbayog City to Tacloban City is P3040, which comes out to P190 per 16 person van. You do not have to have 16 people, but you do have to pay for all 16 seats. With the normal, non-charters I know they wait until the van is full. I don’t know the policy for charter vans, but most likely if you are chartering, then you just pay for all the seats. This is the one way price. Here is something that is interesting and worth making a point of. A regular trip from Calbayog City to Tacloban City is P200 per passenger, but a return trip from Tacloban City to Calbayog City is only P180. The guy said it was a promo, but then he said that it is always like that. That’s not really a promo then, but just so you will know all the facts. Also, according to one of the drivers there, a trip from Calbayog City to Tacloban City takes approximately 3 1/2 hours. Special Note: I hear they have at least one very nice resort in Guiuan. Hours:0500 until around midnight. She said that they close right after the final van leaves (about midnight), but it also depends on when that final van arrives from it’s previous destination. This place is connected to the First Avenue Restaurant. The office is right off the highway actually in front of the restaurant. The lady here seemed to understand what I was talking about, but I’m not so sure. I was unable to get much information from her and if the price she gave me for the trip from Calbayog City to Tacloban City is correct, then they are the most expensive of the 4 shuttle van services. She said that a trip from Calbayog City to Tacloban City is P300 per person. If you plan to take this service, I would double check that price because it seems too high compared to the other available services. I couldn’t find out about a price to charter the van, she didn’t seem to understand what I was asking, but she did tell me that they charter to all locations on Luzon. She didn’t say on Samar or Leyte, just Luzon. I thought that strange, but I’m just gathering the information to pass on to y’all, not judging or questioning their business practices. According to their sign outside they travel to: Catarman (Northern Samar) , Calbayog City (Samar), Catbalogan City (Samar), Tacloban City (Leyte) and Catubig (Northern Samar). At this place I don’t think the guy understood English very well, but he sure was trying. I asked if this van service went all the way to Davao and he said, “Yes”. If they do, they are the only ones that admitted to it. They are also the service that opens the earliest. Notice I highlighted and colored the time they open, 0230. Although, of course, the phone numbers are different, this shuttle service has offices in the same locations as DupTours except this one lists Sulangan (East Samar) as a destination. Those destinations again are: Catbalogan, Tacloban City, Ormoc City, Borongan City, Guiuan and Maasin City. An example of a fare would be from Calbayog City to Tacloban City, per person is P190. What is curious about that is if you want to charter the whole van, then the price is P3500. That is P460 over what it would be to fill the 16 seats (P3040). Definitely the largest of all the van shuttle services. It is along Maharalika Hwy next to the Joy Palace Hotel. 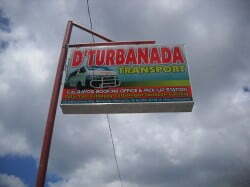 It is also very close to D’Turbanada van shuttle service. Check out their new Alas-Puno on their website. That just means no more waiting for the van to fill up before departing. Usually no van from any of the 4 services will depart until all the seats are filled or paid for. A ticket to Catbalogan is P100. You can then get a ticket from there to Tacloban City for P120. So P220 all the way to Tacloban, but no direct vans. 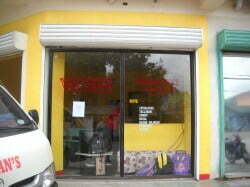 To rent a Grand Tours van from Calbayog City to Tacloban City is P3600. Although the website is still under construction it does have some additional information for you. Please note that as of this date, the address they have on their website is the old location. The location I have on this site is the current site. hello- i want to know the price for each trip via private transfer. The prices the last time I rode are in the story, just read it. There are different prices for different companies. 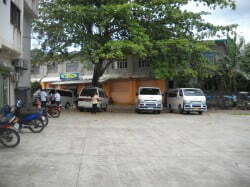 You can not take the van from the Calbayog Airport, but need to go to their office in town. However from Catbalogan you can ask for a van to the Tacloban airport and if there are enough takers they will make a special trip there. I’m looking for a way to get around Calbayog City and the surrounding area for about a week. Last time we were there I rented a car in Manila and drove down and back. This time we are flying down and I’d like to rent something to drive around while visiting the in-laws. Is something like that possible? I can’t seem to find any info about it on line. OBTW, I’m a fellow Texan (San Antonio). Howdy Rodney. It’s always good to hear from a new person commenting, especially a fellow Texan. I wish I had better news for you though. To the best of my knowledge there is no place in Calbayog to rent a vehicle and drive it yourself. Now you can get one with a driver if you want, no problem. You can even do that on a daily basis with different drivers and different vehicles if you want. Now maybe if you are flying into Tacloban, they might have something there, I’m not sure about that. I just sent a FB message to a cousin living in Tacloban to ask him about the rentals there (if they exist). He has lived there a long time and is pretty smart, so I’m sure he knows a bit about such things. I’ll keep you informed on that. If you get time when you get here, stop by to see me. I’ll buy you a beer or two and let you buy me one too. I just got a response from my cousin in Tacloban. He does not know of a place there that rents vehicle either, unless you get a driver with it. I guess just the big cities do that around here. If you want a vehicle with a driver, I can talk to my nephews here. One has a multicab and the other a tricycle. You probably want a sedan or truck though. I have a SUV that I am not using, but the tags are outdated on it and there is no insurance. Borongan is down there in Eastern Samar. I’ll have to do some checking on that to be sure. Don’t they have bus and/or van services there for you to go ask? I’ll see what I can find out through the van and bus companies here though. I did find this page that lists the modes of transportation, but it doesn’t list a particular one. https://www.facebook.com/pages/Borongan-Eastern-Samar/114516528560187# – I”ll continue to check to see what else I can find. Carolyn. Sorry it too me so long to answer. Just got back late this morning from Angeles again. The price of a van from Tacloban to Calbayog, last time I checked comes out to P220 per person. You pay from Tacloban to Catbalogan, then to Calbayog from there. All the van services are pretty much the same. I have not been up to Allen in a van, but it is probably only P100 per person. Grand Tour vans is probably your best bet. Let me know if you have any other questions and thanks for checking out my blog. I hope it helped you and you were able to inform others about it. 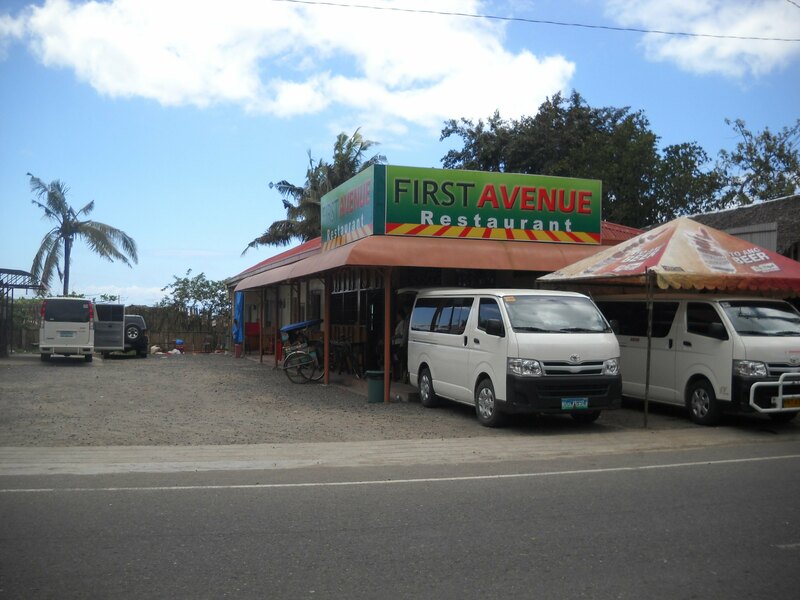 John, which of the 4 transportation companies is the nearest to Calbayog airport? thanks. Howdy Leny. Sorry it took me so long to answer, I was out of town. Actually none of the van transportation places are close to the airport. Most of them are either in the downtown area or a little further away. I don’t know why that is so except that the biggest bulk of their business is by local and not incoming people. If you are staying at the Ciriaco Hotel, Resort and Spa, they have a shuttle that will come by to pick you up and bring you to the hotel. After you finish staying all the van services are a 1 trike P10-P20 trip from the hotel. http://www.cokaliongshipping.com/ is the link for Cebu boats from Calbayog and to other ports, ticket office is on Rosales street next to the news stand, a bus takes you to the port about 18 km north of Calbayog to catch the boat leaving . UJ don’t forget the Jeepney service that runs to North Samar from here. 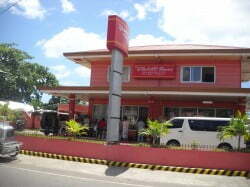 They are at the service station across the street from PNB bank at the Capoocan highway Intersection with Brgy Obereo. Thanks for the website Rick. That ticket office is right there by Metro Bank, isn’t it? I had no idea about a jeepney service. I’ll have to get Ramil to go with me and find out some information on that. I know where you are talking about, but just in case they have an English problem. Because I know I have a Tagalog problem. Here is another website from Rick that he recently shared with me. 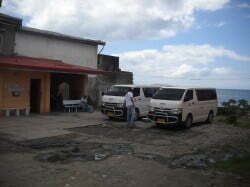 Some good info John,I didnt relize there were that many van services in Calbayog.Good the hear you can charter one. I believe there were only 2 of them (Grand Tours & Van’s Van) when I got here. The other 2 were only started within the last 2 years or so. Thanks John. This is very useful information. I checked out the Grand Tours website. I realize it is under construction but you would think that they would at least have phone numbers. Thankfully, you have that information in your post. I recall that you have taken Grand Tours before to Leyte. Do you remember how long it took? On a somewhat different subject, Jen has told me that you can take a ferry from Calbayog or from Maguino’o to Cebu. Do you have any information on this? By the way, during my first trip to Samar, I had trouble pronouncing Maguino’o so I took to calling it Barry Manilow and that is what Jen and her family now call it. Yes I noticed they didn’t have a phone #, so I made sure when I went by to get those #’s. I have not been south in the vans for a few months, but here is what I remember about it. From Calbayog to Catbalogan is about 2 hours. From Catbalogan to Tacloban is about 2.5 hours. From Tacloban to Tambis is about 3 hours. They could all be more or less .5 hours, but I think I got it all right. That’s about 7.5 hours just for the riding part, not including the waiting for a van in Catbalogan and Tacloban. All together it takes up a big portion of a day, so start early. Yes there is a ferry that goes to Cebu, but I don’t have the information on it. I’ll put it on my list I now have for things to do. That’s how I remembered this post. Good info John. Based on these prices, It just might me buy our own vehicle when we get there!